Lili here, Chucklefish art director, and producer! And despite being working on Wargroove since day 1 this is my first Dev Blog! I grew up in Sweden but I’ve lived in London for the past 9 years and I’ve been working as a game developer for 5 years. I’m taking a quick break from our busy development schedule to tell you all about one of Wargroove’s (in my opinion) coolest features, that’s been implemented quite recently. Wargroove is filled with maps that will encourage strategic battles. But our campaign isn’t all just about the clash on the battlefields – the story will also be presented to you through cutscenes! These cutscenes are created in our very own cutscene editor. I worked closely with our programmer Krakauer to make sure the cutscene editor is up to scratch with the team’s expectations… And I have to admit that it’s really fun to use! To show off the editor, I’ve made a little demonstration cutscene just for this blog post. Here we can see everyone’s favourite good boy Caesar bounding into action to chase after that pesky undead Felheim army. We’ve certainly come a long way since the cutscenes shown in our original announcement trailer from last year! As you can see below initially all cutscenes were static portraits with on-screen text only, but we found this just wasn’t giving us the flexibility we needed to tell the stories we wanted. The cutscene editor will be fully available across all platforms of the game, and you can access it as soon as you boot up Wargroove for the first time. It’s really simple to use, so you’ll be able to create your very own campaign cutscenes and share them online with your friends in no time. I can’t wait to see what stories you create! 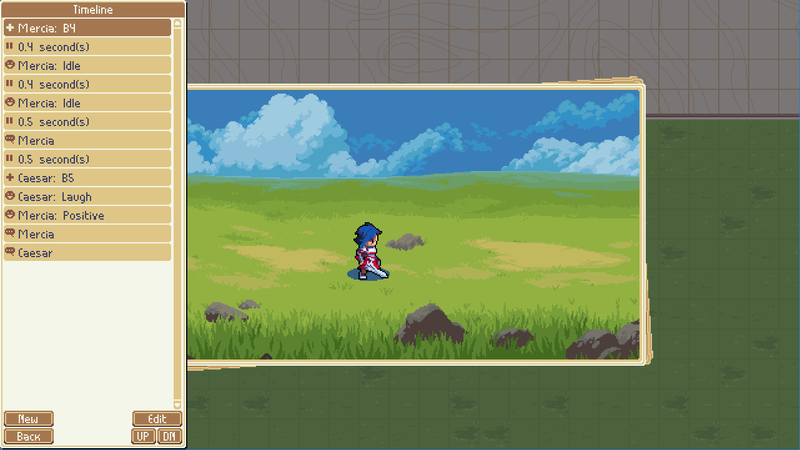 Now I have to go back to creating some Wargroove cutscenes. See ya! We’d love to hear your thoughts on the cutscene editor on our forums or the Wargroove subreddit! You can also follow us on Twitter and join our Wargroove Discord channel to keep up with the latest news or check out our official wiki!